So. You’ve been working on that book for ten years now. You’ve submitted it to dozens or hundreds of agents and publishers, without success. Sometimes they say no, but often they say nothing at all. Or even worse: They ask to read your full manuscript (yippee!! ), and then return with a brutal critique and rejection. I know the struggle, the sting, the existential wound. 1: First and foremost, stop submitting your work anywhere. You’ve probably heard this adage a thousand times, but it’s timeless: One definition of insanity, is to continue doing the same thing but expect different results. No matter what it is that you write, the market for it is finite. The worst thing you can do here, is to keep on using the same pitch that has failed you repeatedly. So call a time-out, for as long as it takes. When your book gets rejected again and again, it’s easy to get bitter. Resentful, discouraged, demoralized. But if you remain in this emotional state, your path will only get harder. Frankly, we can can detect bad attitudes a mile away; no matter the quality of your writing or your story, we won’t be interested in doing business with a grump. Remember, we have an abundance of other choices, so we won’t obsess over yours. 3: Accept your place in the industry. You might be a great writer – but there are lots of great writers out there. You might have a wonderful story – but there are tons of wonderful stories out there. Few writers get that dream deal with their first book, or even the third. You have not been singled out for extraordinary torture; rejection (along with dues-paying) is just a natural part of the journey, in any career you might choose. 4: Find out what you’re missing. Chances are that if you received a hundred rejection letters, few of them gave you any useful feedback. So how do you plan a way forward? Join a critique group. Find a mentor. Build a library of writing reference books. Spend some serious coin for conferences and professional editing. Learn from your mistakes and pledge to do better in the future. Many writers, I’m convinced, set themselves up to fail. Did you pitch your mystery novel to a publisher who only handles romance? If so, don’t blame the guy if he doesn’t respond. Did you turn down an offer because they offered a tiny advance? You might have missed out on a good opportunity. Did you send out the same form letter to hundreds of places at once? (Don’t laugh; I see it all the time.) If so, you made it impossible to make a mid-stream course correction. I can tell you with absolute certainty that you ruined your chances with most of them. Every publisher, and every agency, has a process for how they want to receive submissions. Some want a query, period. Some want a query and sample chapters. Or the whole manuscript. Or a proposal. Some require email attachments, while others forbid them. Whatever they ask for, send them exactly that and nothing else. 7: Build a better business. If you want to work in this industry, writing is only about half of the equation; you’ll need to learn how the market works. Find out which agents, and which publishers, handle the kind of book that you’ve written. Know your target audience. Know the customary word count range for your genre. If you write for children, learn how to make the age-appropriate word choices. If for brain surgeons, do you have the right credentials? All of these things will be important, as you go forth to pitch your book. 8: Build a better book. You believe that you have a gift for writing. And maybe you really do. But you’re in the big leagues now; your spelling bee championships, and your high school writing awards, mean nothing now. Use the lessons you learned in step 3, to improve your writing and your story. Depend on your situation, it’s possible that you have already exhausted the pool of desirable agents and publishers for your book. Or you’re close. (You don’t want to sign with just anybody.) If this is the case, you might be better off to start into a new project, based on the lessons you’ve learned. 10: Think twice (or thrice, or whatever it takes) before you settle for self-publishing. We’ve all heard the stories about the self-pub authors who went from obscurity to huge success in a short time. Could it happen for you? Sure it could, but those cases are exceedingly rare. In the meantime, the reasons why you were rejected before (even if no one told you what they were), will still matter. Whether it was for your bad grammar, or plot holes, or inadequate platform, the market will judge you more harshly than the industry ever did. Maybe you noticed, the first seven points in this list have nothing to do with writing. 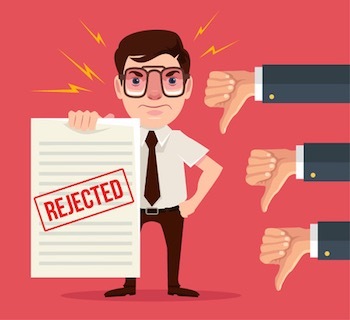 And for good reason: For every ten rejections you receive, chances are that at least five them came before they read a word of your manuscript. Give us a reason to read it. Without giving us ten reasons not to. We might surprise you. I'm fairly new to writing, but I was amazed to see so many people in my classes and critique group in almost all of those suggestions.